The administration is to regularly evaluate the viability of schools and school clusters in light of population dynamics, facility adequacy, and site capacity. Current demographic information will be maintained for the District and for each school. Information about the adequacy of school sites, location, access, surrounding development, and transportation requirements will be updated annually. Proposed changes in attendance areas are submitted to the Board of Education for approval by the Superintendent. Changes will be administered by either boundary changes or administrative changes. It is the policy of the Board to minimize the movement of students between schools when a boundary change occurs. The Board will weigh movement of students when boundary changes must be made in order to balance school enrollments. After a boundary change has been implemented, additional changes in the affected attendance area will not be made for at least three years unless there is a substantial increase or decrease in the student population or unless other circumstances arise which adversely affect the attendance area or nearby attendance areas. The boundary changes process is a result of on-going district analyses of schools attendance areas. 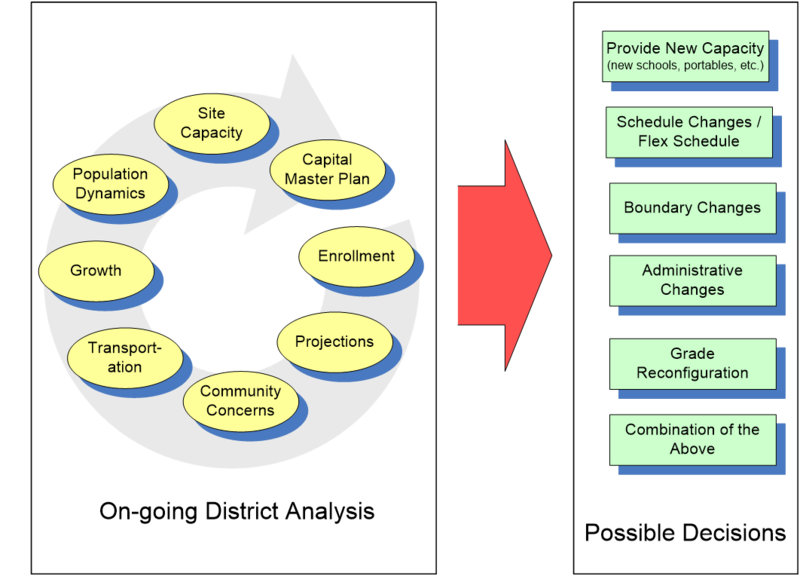 The process is based on ongoing analyses of enrollment, projections, community concerns, transportation, growth, population dynamics, site capacity and Capital Master Plan. Based on the analysis and need, possible decisions for Boundary change or Administrative change are made. The process is described on the chart shown above. Administrative Changes impacts only a small geographic areas (e.g. individual neighborhoods). The Boundary change process goes through series of meeting where all the stakeholders are involved during each step. The flow diagram shown below explains the steps. Impacted school principals in conjunction with Parent Teacher Organizations (PTO) select the parent and teacher representative for their school. Decisions are made based on empirical and qualitative data, as well as educational and community needs of students. Proportions of students transported are minimized to encourage walking and neighborhood schools and to minimize transportation costs. Natural boundaries such as arroyos, major thoroughfares, and natural demarcations are used.